The Apple Maps fiasco has been a thorn in the side of Cupertino ever since Google Maps was given the boot earlier this year when iOS 6 launched. Its faults and shortcomings have been thoroughly documented and aside from some general frustration from most users, nobody has really been any worse for wear – or so we thought. 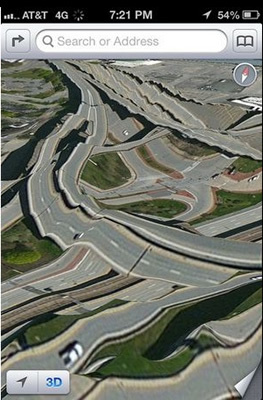 A new report from Down Under reveals that Apple Maps has been responsible for a lot more than just casual frustration. In fact, police in Mildura are urging motorists to proceed with caution as the software has led a number of travelers into dangerous territory in recent weeks. Local police have reportedly been called to assist distressed motorists that were led into the Murray-Sunset National Park and became lost due to incorrect directions. Authorities have conducted their own tests on the software and found it shows Mildura is located in the middle of the national park. In reality, the city is located some 70km away. You may not think that being stranded in a national park would pose much of a threat but that’s probably before you factor in that there is no water supply and temperatures can reach nearly 50 Celsius during the summer months. As a result, police say a few drivers were stranded for over 24 hours without food or water. Others walked long distances over rough terrain in order to gain cell phone reception. Mildura police have reportedly contacted Apple in hopes of getting the error fixed in a timely manner.